Last year (almost exactly a year ago, actually), Ruppert-Leroy's brilliant Champagnes became some of the most well-received wines of 2017 after wowing all of us ('us' and in us and all of you). Might as well celebrate that anniversary, right? Ruppert-Leroy is on a roll right now and I can say without any ambiguity that they've easily become one of my top-3 favorite producers in the 'grower' category and really in all of Champagne at that. The style is oxidative and savory, but with tremendous lift and energy, as well. Their 'house style' wine, if you will, is the '11,12,13...' (yes, the ellipsis is part of the name). I hesitate to call it their 'entry-level' or 'baseline' wine, because it's not. It is, for me, their 'snapshot' wine, the one that showcases what they're all about, kind of like what Grande Cuvée does for Krug. The reason the ellipsis is part of the name, is because this is a solera wine, and the first edition of it was comprised of the 2011, 2012 and 2013 vintages. The '...' represents everything since then, which in this bottling goes up to 2015. It showcases all of the signature elements (taut, racy, mineral, nutty, savory, etc.) in one bottling. Then, we have two of their single vineyard wines from 2015, each of which focuses on some of those elements in particular. The Blanc de Noirs Les Cognaux 2015 (100% Pinot Noir), which I must say I'm pretty enamored with right now, is all about those savory, cheesy nuances and a broad, but elegant profile. The flavors are deep and compelling, with nice Pinot Noir richness, but it still manages to be quite graceful, as well. Then there's the Blanc de Blancs Martin Fontaine 2015 (100% Chardonnay). If the Cognaux is the bon vivant of the lineup, the Martin Fontaine is the high-minded, polished intellectual. It's incredibly eloquent, but in a restrained, suave way. The taut, mineral backbone radiates out to a very fragrant and elegant profile that's at once nutty and complex, but at the same time very refined and understated. 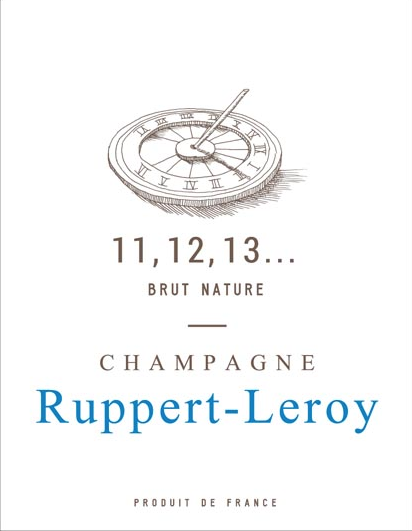 Champagne is full of gems these days, but for me Ruppert-Leroy is one of the brightest. To inquire about this wine, please email info@mcf-rarewine.com or call 212.255.8870.